Uniforms, Organization and History of the Waffen-SS - Volume 1 - by Roger James Bender and Hugh Page Taylor. 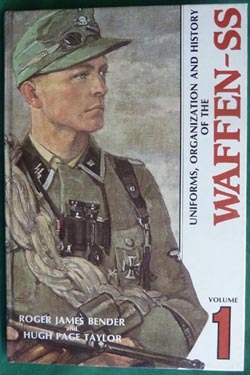 This is the first of several volumes of "Uniforms, Organization and History of the Waffen-SS" and covers such subjects as basic Uniform types, Headgear, Rank Insignia, Trade Insignia and Waffenfarben. Bender Publication - 160 pages - pristine condition - great Reference Book.